Operation North Pole Christmas Train-2017 edition-N Scale-by Kato. Spreading the Spirit of the Holidays to Children in Need. Operation North Pole (ONP) is a volunteer-based public charity. ONP works with Chicagos major childrens hospitals, providing a day of fun and fantasy for families who have a child battling a life threatening illness by hosting a fantasy trip to the North Pole. The magical experience includes, breakfast, a festive train ride to the North Pole, a visit with Santa, winter wonderland fun, entertainment, treats, personal wish list gifts, and much more! It’s ONP’s goal to provide these families an unforgettable experience amidst very challenging times. Kato USA has partnered with Operation North Pole to bring these special Christmas Trains – replicas of the real life Christmas Trains that are operated each year – to life as a means to support ONP’s goal of spreading the magic of the holidays. To that end a portion of the proceeds from every sale of an Operation North Pole Christmas Train Set goes towards this charitable venture to help fund the chartering of this yearly train! 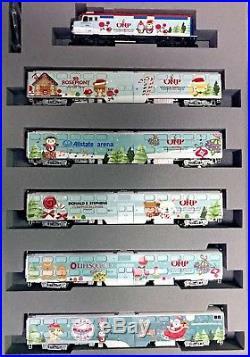 Each year ONP charters a special Metra train, designing special vinyl wraps that adorn both the outside and the insides of the cars. Each years’ design is unique, making each train a festive and colorful display. This train runs on the Union Pacific Northwest Line of the Chicago Metra commuter service, operating not only as a special charter train but remaining in service for a period after the Christmas Train event as rolling billboard to spread awareness of ONP and their goals. Gallery Bi-Level Coaches and Cab Coaches. The modern Nippon Sharyo-built Gallery Bi-Level is based off of the same concept as the original Santa Fe El Capitan Bi-level design concept, whose success went on to inspire such double decker cars as Amtraks Superliners and the Bombardier Bi-Level car which is also used in commuter service. Today, gallery Bi-Level cars such as those used by the Chicago Metra commuter service can be seen operating in several states across the United States, such as Virginia and California. The F40PH locomotive uses a sophisticated lightpiping and LED system to give it directional headlight and taillight functions on the front of the locomotive for push/pull operation. All cars are DCC friendly, with FR11 decoders available for optional 11-211/212 Version 2 Interior Lighting Kits with LED. Bi-Level cab coaches feature directional lighting for push-pull operation, with alternate illuminating headlight and taillights with an on/off switch for mid-train operation. An optional FL12 decoder can be installed in the place of the slider switch to provide DCC control over the directional lighting. Drop in DCC compatible with the Train Control Systems K5D7. The item “Kato106-2017 N OPERATION NORTH POLE SET 6 pc set (in BOOK CASE) Christmas Train” is in sale since Thursday, January 24, 2019. This item is in the category “Toys & Hobbies\Model Railroads & Trains\N Scale\Passenger Cars”. The seller is “les483″ and is located in Indianapolis, Indiana. This item can be shipped to United States, Canada. Post filed under kato106-2017 and tagged book, case, christmas, kato106-2017, north, operation, pole, train.